For those of you who didn’t get a chance to attend the Birthday Bash live show today in Dallas, Texas, we’re unveiling a special treat for you. 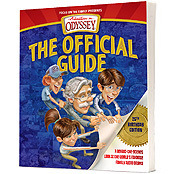 In October 2012, the second edition of Adventures in Odyssey: The Official Guide will be released, containing expanded features, episode information, and more. Today, the final cover art is available. This book is devoted to the world’s #1 audio drama and contains hundreds of pages of information. To learn more about this upcoming book release that no fan can do without, you can visit our product page (and see a high resolution version of the cover). What are your thoughts on the cover design? Be sure to share your thoughts in the comments below. All Aboard for Adventures in Odyssey’s 30th Anniversary!